Finally... some beautiful spring weather to dress for and enjoy! We had so much fun taking advantage of it over the weekend. I was happy I got to wear my pregnancy uniform of body con dresses and that Crosby got to wear some of her cute new spring outfits she got for her Birthday! We did it! We moved Crosby into her new bedroom over the weekend... so far, so good... or about as good as can be expected while she's teething and going through a sleep regression. No one is getting a full night's rest around here these days. Now that we have less than seven weeks until baby boy is due, it's crunch time to get the nursery ready. I wore this outfit on Sunday when we officially made the room switch, snapped a mirror selfie and got so many questions about where my overalls and other pieces were from, I knew I had to shoot it for a blog post. Once you get to a certain point, a really hard part of pregnancy is getting dressed. I'm not the biggest fan of maternity clothes and try my hardest to wear my pre-pregnancy stuff as much as possible. Of course some things are no longer an option, like my fav high-waisted Levis with tops tucked in. But I did have a few pairs of jeans that were still (somehow) fitting... until recently. After the first of the year nothing was comfortable anymore. Enter the Bellaband. Now I can wear my favorite stretchy jeans un-zipped and un-buttoned and NO ONE has to know. 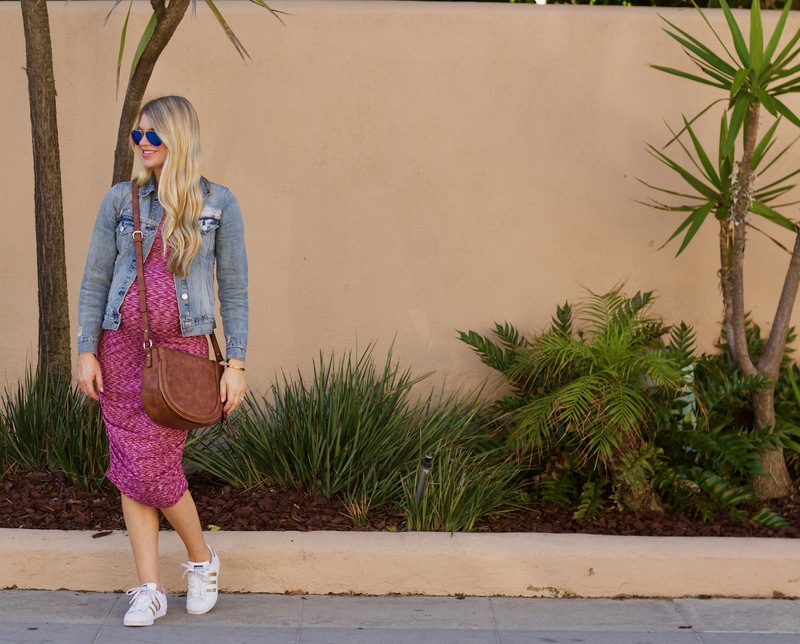 I wore this pink dress over the weekend, we celebrated a little babymoon about an hour south in La Jolla. I can’t be too far from my doctor right now and this was the perfect escape, I’ll share more details from our weekend later!